Gifts and entertainment can be crucial to maintaining good employee-client relations, but they can result in conflicts of interest risks if not properly managed. The StarCompliance Gifts and Entertainment product allows employees to pre-clear and report planned gifts and entertainment, ensuring that conflicts of interest are avoided. By fully digitising the receipt and declaration process, STAR eliminates the need to maintain paper records. Employees can use the STAR application to seek automated approvals to give or receive gifts and entertainment. Pre-clearing this type of activity has become especially important in light of the Foreign Corrupt Practices Act and the UK Bribery Act. The pre-clearance feature maximises the benefits of STAR’s integration with your company’s HR system, so all details about each employee are taken into account, along with historical gifts and entertainment records, to arrive at a decision about whether to allow the requested action. The system returns one of three automated responses – approval, denial or need to review. In the case of ‘need to review’, the request will be passed on to your line manager, department head, or compliance team for further scrutiny before a final decision is reached. The system can also aggregate gift and entertainment requests relating to specific individuals or companies, to ensure that gifting limits for each client, supplier or employee are not exceeded. The STAR platform collects and integrates data from systems across your business, which are cross-referenced when any request relating to gifts or entertainment is made. Your compliance team can set the rules for automatically surveying this data, whenever an employee makes a pre-clearance request for gifts or entertainment. STAR can pinpoint high-risk employees, external contacts and groups by monitoring records to identify suspicious activities. It can automatically raise cases that may violate your company’s specific code of ethics or its gifts and entertainment policy. It also enables your compliance team to survey employee records for anomalies or patterns of behaviour that may require investigation. The automated pre-clearance process assesses the value of each gift or entertainment request and applies your company’s specific compliance rules on giving and receiving gifts and entertainment. Each request will be assessed individually, taking into account the role of the employee in the company, their individual gifting allowance, the nature of the gift and the relationship of the giver or receiver to your business. 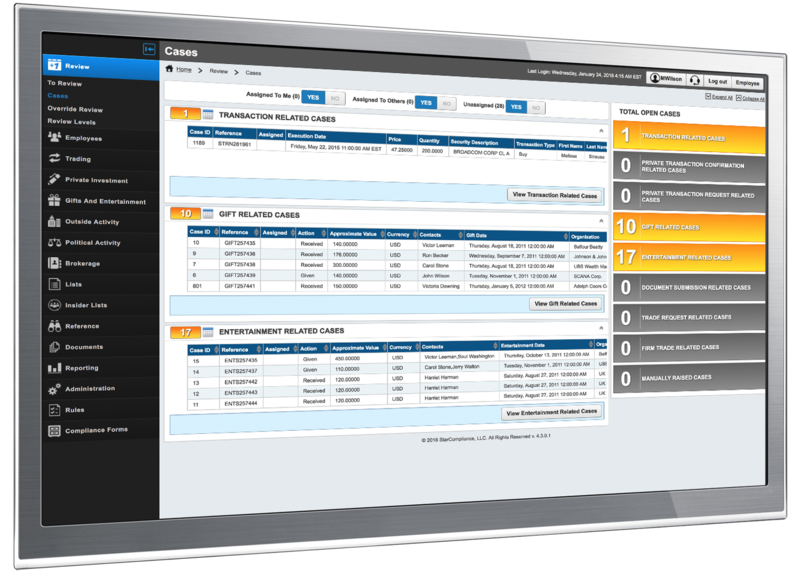 The STAR case-management product brings together all gift and entertainment requests that may require investigation by your compliance team. It enables you to collate data and evidence, add annotations and assign the case to relevant team members for resolution. The whole cycle, from detection through investigation to resolution, is recorded on the system for audit purposes, with management reports available to help identify trends and support continuous improvement. The STAR reporting and management information suite gives compliance teams a 360-degree view of all employee behaviour and activity. 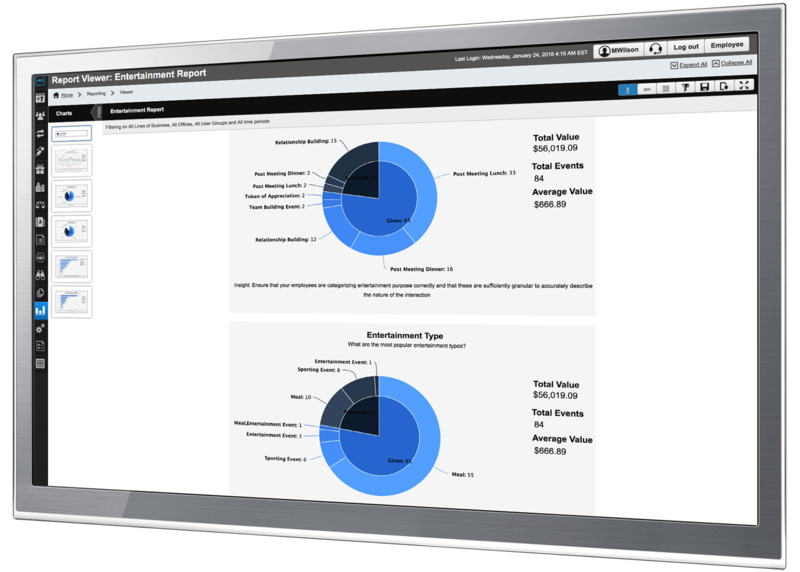 It enables comprehensive and meaningful reports to be generated, which can be fully customised. 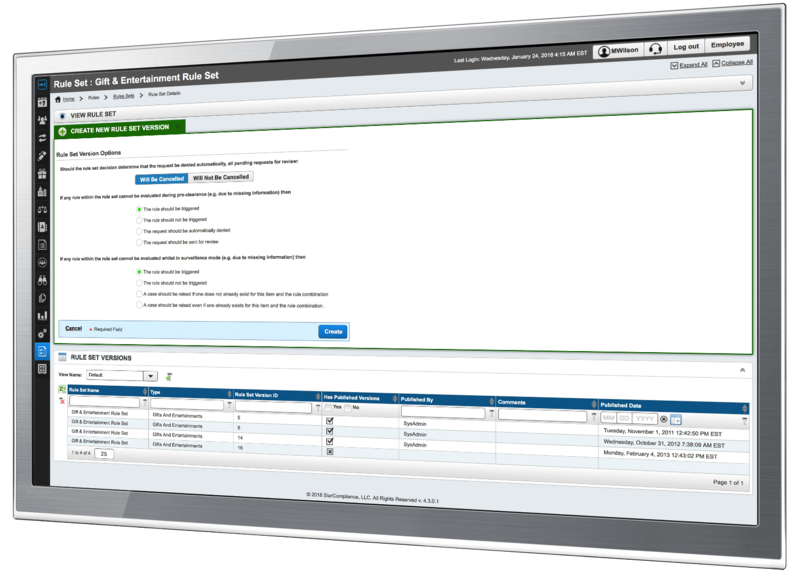 There are more than 100 standard reports in the system, and you can design many more to suit your requirements. You can choose from a range of intuitive graphs and charts to make the information clear and easy to interpret. 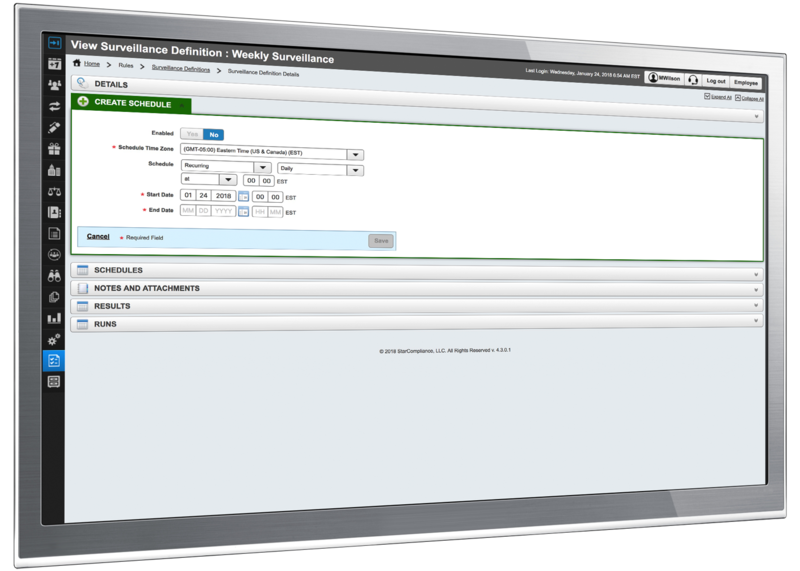 Additionally, you can create a suite of reports to be generated automatically at required intervals. The reports can be displayed in-app, saved for later use, distributed via email to selected personnel or exported to Excel spreadsheets. 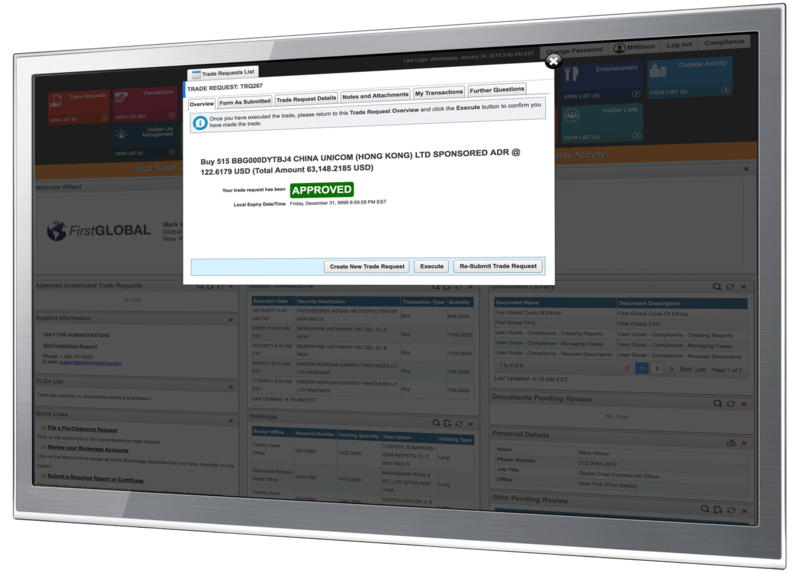 This feature allows you to manage client company details entered by your compliance team or taken from any other data feed so that employees can choose from a pre-selected list when making pre-clearance requests for gifts or entertainment. 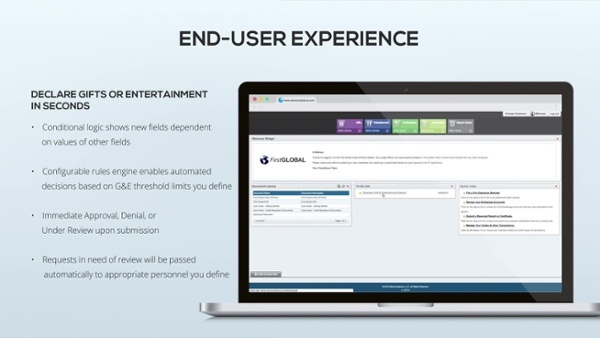 This feature enables employees on the road, such as sales teams, to submit gift and entertainment requests using the CRM system they work with every day, eliminating the need for double data entry. The STAR platform can be integrated with any third-party CRM systems that you already use. By integrating with your own expenses system, this feature enables you to monitor spending on gifts and entertainment more easily. It means that gifts or entertainment paid for on corporate cards, which may not need to be reported, can be captured by the system for compliance monitoring.